He left the complex behind. Driving sluggishly down the street, he was shocked at the amount of snow that had been unceremoniously dumped across the Minnesotan landscape. Roads had disappeared. Parking lots were closed off. Snow sat on building roofs like decadent helpings of vanilla icing. Making an ungainly right turn, he unsteadily began moving up Robert Street. Without question, this would be a difficult drive. His parent’s house was a good 20 miles from the complex and also out in the country. If road conditions were this bad in the urban core, he couldn’t imagine what he would find west of Woodbury and south of 94. Horrible visions assailed him, one involving him wrapping his car around a frost-covered tree while screaming bloody murder. Nudging the car forward, he coasted down the ramp and onto Highway 494, snow particles flying on each side of the vehicle. So far, so good. There weren’t many people on the roads yet. For one thing, it was early, and many were likely waiting for the plows to make some headway. The circumstances were ideal, as much as a post-blizzard drive could be ideal. Still, he was wildly sleep-deprived and emotionally spent; even under ideal locations this drive would be torturous – both literally and figuratively. He continued to putter along, and soon the Mississippi River valley spread out before him. The river itself was a boorish grey, with only the lightest of blues visible amidst its somber tones. On both of its banks sat a mess of industry, some heavy and some light, some active and some defunct. Passing over Concord Blvd., which was one of South Saint Paul’s main roads, he was struck by the desolate nature of the area. Concord was a gritty street, devoid of life or activity. But it hadn’t always been this way. His father had lived much of his early life near Concord. He had occasionally told him about life in South Saint Paul before the packing plants near the river had closed, about the hustle of Concord that had long ago faded away. Aside from one or two amazingly derelict bars, one of the only notable structures remaining on the road was the Stockyards Exchange building, a Romanesque, brick-heavy, turn-of-the-century structure that stood wildly out of step with its surroundings and time. At one point, the building had served as the nexus for an entire industry and community, with four different plants swirling around it and operating out of it. Now it was largely defunct, acting as an entry on the National Registrar of Historic Places and little else. Times changed, as did cities and communities. Although he was unaware of exactly what drove this, he had seen this change firsthand. Many neighborhoods on the south side of Chicago had once been healthier but were blighted and unstable by the time he arrived in 2006. Conversely, many up-and-coming places such as Humboldt Park on the city’s northwest side had stalled when the recession took hold in late 2007, their development prospects remaining incomplete and unfulfilled. His car’s wheels churned against the press of snow. Slowly, it began climbing onto the Wakota Bridge, pushing the gritty albeit atmospheric nature of the east side of South Saint Paul into the rear-view until its particulars were lost against muddy-looking hills. Newport was the next city he passed on his usual commute, a small river town that had hardly been booming even before Highway 61 was reconstructed a few years ago. It was a city that had struggled with its identity before this upheaval, and which now seemed almost too far gone to establish anything of substance. If geography was destiny then Newport had always had the proverbial deck stacked against it, its prospects determined by variables outside its control. And yet, circling around on 494 he thought that this opinion may not be entirely legitimate. He didn’t know how he had missed it before, but large-scale development projects were being erected on each side of the highway, indicating that even a city seemingly as lost as Newport could find its footing given enough time. The landscape blurred around him as he picked up speed on 61, which was far more plowed than the interstate. He passed the Newport graveyard, whose gravestones stood out even against the bleached incline they rested upon. Then came the St. Paul Park refinery, which appeared almost totally unaffected from the previous night’s storm, its flames blazing merrily from several of its turrets. He whipped past a sign that read “Cottage Grove, Est. 1843” and was hit by a gut punch of memories. Of all the towns in the southeast metro, Cottage Grove was ironically the most evocative. He had worked there and gone to school there. This was where he had first learned to drive, gotten his first kiss, and wondered, for the first time, what lay further down the road in either direction. It was where, during his high school years, he had spent hours after school with a core group of classmates and friends, working in the school theater, practicing for mock trial and training for speech meets. This was where his days had been full and meaningful, where, from sun up to sun down, he would break only for meals, returning home at the end of the day safe, satisfied and happy. This was the place where he had gotten his first girlfriend. He could remember, acutely, their last summer together, a seemingly endless stream of parties, excursions and events, He hadn’t loved her, but he had come close. They had never gotten their chemistry totally right, but they also hadn’t had much time. Only meeting during senior year, their time together had been short, finite, set against a perpetually running clock. He could still remember when they had parted. He had pulled her close on their last night together, a warm summer evening before he was due to move to Chicago. During the drive through Wisconsin the next morning, he had felt cold and sedated, as if he was locked inside a walk-in cooler. It should have been over then. But he didn’t stop. Couldn’t stop. A wild, frenzied series of drunken phone calls ensued after he arrived in the Windy City. These calls were necessary for him, humored by her and in the end unproductive for everyone. Gingerly, he moved off the highway onto 80th Street, a thoroughfare that passed directly by his old high school. As a whole, the landscape was bleak, with myriad chain restaurants, sprawling parking lots and big box stores visible on all sides. Yet its bleakness was infused with the undeniable power of nostalgia, giving it a sense of meaning and pathos that didn’t exist anywhere aside from his mind. Cranking the wheel, he turned onto 80th Street, losing control slightly before course correcting. Images of the town passed by on each side: his school, what used to be his family’s church, the park where he used to play – all cloaked in snow, buried but still there. Reaching the town’s outskirts, he passed what developers had intended to be a new neighborhood of McMansions: large, spacious yet strangely anonymous homes that had been priced at a $400K at the height of the housing bubble. Now many stood empty, their windows dark. Some were even unfinished – their half-built facades looking like a vision of the apocalypse. Moving on, he slid past the Cedarhurst Mansion, a beautiful structure built in the 1860s. Sitting on a ten acre estate, the home had once solely hosted the elite. Now it acted as a simple venue, an event space for anyone looking to tie the knot. Past the mansion, the landscape turned into pure country: a dizzying expanse of endless fields and lonely farmhouses. Out here, the roads were as horrifying as he had expected them to be, so choked by snow that it was impossible to tell where street ended and countryside began. He inched along at a snail’s pace, and he took his foot completely off the gas pedal when he passed the United Church of Christ, which sat on a slight decline. Past the church there was little of note, windows on both sides of the car revealing simple, white void. It wasn’t until he reached a sign that read: “Afton Alps – 3 Miles” that the landscape began to noticeably change, transforming from a pastoral pancake to the more varied terrain of the St. Croix River Valley. Here there were dips and dives, hills and ridges, water and trees. Forests of upland hardwoods and pines stood amidst open prairies, all sloping downward to the rocky shores that bordered each side of the now frozen St. Croix River. When he reached the entrance of Afton Alps, a sizable ski area that bordered Afton State Park, he turned to the left and then to the right, which brought him into the cul-de-sac where his parents’ house stood. It wasn’t a moment too soon. He was tired and depressed, almost on the verge of tears. Going up the driveway, he was forced to gun the motor due to the snow, an act that siphoned off remaining vestiges of strength. He parked and turned the car off. Then he opened the door and walked up the path to the house. Turning his house key in the doorway that led into the mudroom, he could feel the sleep in his eyes. All he wanted was to go to bed. The lock clicked and he pushed the door open, stepping into warmth and comfort. The mudroom was small, maybe five feet by nine, with an elegant armour that he hung his coat on. Taking off his outerwear, he walked onto yellow and green linoleum tile and then onto red and brown cherry wood of the dining room. The house was silent, and he stood waiting, his homecoming feeling incomplete. Where were they? A mild anxiety began to creep into his body, a feeling that had to be one of the most unpleasant on earth. To the right came a groan, an imitable sound that was not quite human, although he often anthropomorphized it. 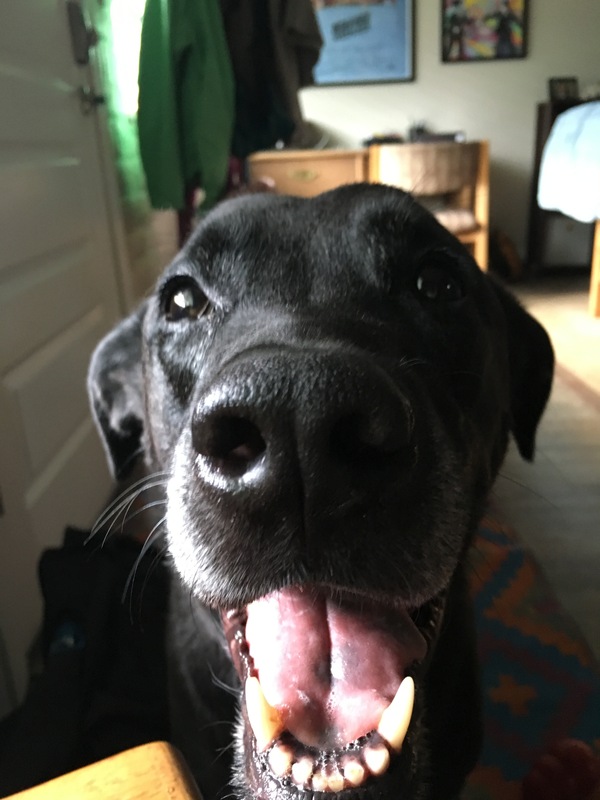 Boston, his six-year-old chow/black lab mix, had been laying on the brown leather couch that sat in the living room adjacent to the dining area. He was slowly getting to his feet, tail beginning to pick up speed as he rose. “Hi boy!” he exclaimed to Boston, his weariness abating slightly. Boston’s ear’s jerked upward at the sound, and his mouth opened into a goofy grin, revealing teeth whiter than the snow outside the house. He hopped off the couch, giving another little groan as he landed on a soft, ornate rug. Spotting his favorite toy nearby – a red, squeaky ring – Boston scooped it up in his mandibles and then trotted into the dining room. Boston had always been a growler, but not in the typical way. For whatever reason, growling was how he expressed excitement. The more excited, the more he growled, and the more his excitement was encouraged, the more fluctuations would occur, until he was emitting an adorable choral ode. Behind him, the sound of skittering little feet was becoming louder and louder. Reaching out, he put one hand on Boston’s head, which was now pushing against his leg, red ring still clamped within his jaws. He turned and saw what looked like a black fox streak into the room. Minnie, his second dog, was charging towards him. A Schipperke and Sheltie mix, Minnie was small and compact, no more than 20 pounds, with arrowhead ears that shot up away from her small, triangular head and a curly tail that would put a pig’s to shame. Yipping and yapping, she charged at his feet, rearing up when she reached them to lick his hands. He couldn’t understand why, but something was caught in his throat, an emotion, a feeling that was out of proportion with her arrival on the scene. He had seen her last night, but it felt as if she had been gone for years. He bent down, temporarily ignoring Boston who went on growling merrily behind him. She was in his arms, dancing and wiggling about. Then she pranced away, exhibiting the proud haughtiness she had displayed ever since her puppy days. Facing away from him, she snapped back and forth, head careening from one shoulder to the other. He took a couple of dramatic steps towards her, heavier and quicker than normal, movements designed to send her into a playful frenzy. It had the desired effect. She jutted forward, still snapping and spitting, a beacon of energy and emotion, of indomitable spirit. Watching him, Boston broke out into another toothy grin, which caused the ring to fall from his mouth in a slobbery heap. His dad, Jon, had appeared at the hallway that branched off from the dining room area and led to his room. He was dressed for work, clearly in the final stages of getting ready for the day. He straightened up, wiping his eyes and pushing Boston away, who was still growling behind him. Jon walked further into the dining room. He was in his mid-50s and was starting to show his age. His hair – which had once been an even mixture of salt-and-pepper – was now skewed definitively towards the salt. His face was also now deeply-lined; although, he still didn’t look like your archetypal “old man.” In a certain light and on a good day, there was still a boyishness to his looks. His eyes were behind much of this, which, despite being a common brown, shown out with wit and intensity. It could also be attributed to his smile, which imbued his face with vitality. “Do you wanna talk about it?” he said to his son. “I don’t know what to do anymore,” came his response filled with hopelessness and self-loathing. Looking at his son, Jon felt conflicted and more than a little hopeless himself. There was no doubt that, since his graduation, his son had been having a difficult time. But how much could Jon really do about this? He had let his son come home. He had let him move in. He paid for groceries each week and tried, whenever possible, to ease the financial burden in which his son now found himself mired. Yet Jon’s affection and sympathy was now quickly giving way to exasperation. His son thought he had it bad, but he actually had no idea. While he had spent his college years waiting tables and working menial office jobs, Jon had worked inside the Swift packing plant doing hard labor. While his son had scraped innumerable plates free of bits of bacon and steak, Jon had been tasked with literally spraying working stations free of cow gore and viscera. Jon also understood, however, that the world had changed. He had graduated from college a couple thousand dollars in the red, but his son was tens of thousands in the hole. Today’s economic woes were also considerably worse than the malaise of Reagan’s “Morning in America,” which had greeted Jon upon his own graduation. Finally, required qualifications were also exponentially more intense these days. A masters was the new bachelors, a bachelors the new high school diploma – and so on. But these factors were beyond his ability to influence – at least in any direct way. You can’t choose the times you’re born into. And he would continue to lay foundations for his son, provide him with the atmosphere he needed to figure things out and put plans into action. But beyond that, he was on his own. This wasn’t because Jon wanted him to suffer but because he only had so much to give. Jon had never become rich, but he had done better than his father. And in that sense, he had embodied the American Dream. His son, however, would likely do worse, encapsulating, once again, that myths of endless growth and endless progress were simply that, myths. Still, his son would be alright, even if he didn’t know it yet. Demographics were in his favor. He wasn’t a rich kid, probably never seen a silver spoon outside of a museum, but he had it better than most. “Well, you’ll figure it out,” Jon said finally. His son’s mouth dropped open, as if Jon had told him to go to hell. The older man felt his insides freeze up, but there were no magic words, no immediate fixes. Jon had meant his statement to be reassuring, but it was clear that his word no longer carried the god-like power they once had when his son was younger. Memories from those earlier periods came roaring back. He was on a suburban little league field and his son was walking up to him, bottom lip quivering after grounding out for the third time in a row. “Dad, I’m not very good at running,” his then 10-year-old son had said, round face dominated by large, tearful eyes. His son then started running through names on what had then been the Twins starting lineup, inquired into the “Slump-Status” of each. Chuck Knoblauch, who would go on to have a complete nervous breakdown when he was traded to the Yankees in 1998, was his son’s favorite player by far at the time. He collected every card and even emulated his outrageously awkward batting stance. Then Jon moved further into the past. He was laying in his old bed after finally putting his son to sleep. Just as he was drifting off, his then eight-year-old son had run into the room, eyes wild with fear. “Dad. Someone is in the house!” he had shrieked breathlessly, air whistling through the holes where his two front teeth had recently been. “No, there is nobody here. But even if there was someone there you wouldn’t need to worry. You wanna know why?” Jon said, brushing tears away from his son’s watery eyes. He lifted up his shirtsleeve and flexed his bicep, which back then had bulged outward rather impressively. His son immediately grabbed it, eyes widening with amazement, a smile tugging at his lips. Such maneuvers would not work now – for obvious reasons. His son was no longer contending with poor batting performances or imagined boogeymen. What he was facing was something far scarier: the horror of adult life. “I’m sorry; I have to go now,” Jon said, moving towards the mudroom and picking up his keys. “You’re leaving?” his son responded in shock. He was put off by his dad’s abruptness. The stoic calm that he so often appreciated now felt somewhat dismissive. He wanted more. “Yeah ok,” his son murmured, barely audible. Jon put on his coat and gloves. Pausing at the door leading outside, he turned and looked back at his son, who was heavily slouching against the counter. Jon again wanted to say something, wanted to alleviate how his son was feeling. He felt the desire to lift him up, assure him that big things were coming around the corner. But then something stopped him, curtailed him, took away his words. He had never been one for false promises. And he had certainly never been one for false hope. Not everyone gets to live their dream. He had always thought this and expressed this openly, even when his son was young. “Dad, can I be anything I want to?” his son had asked him once years ago, obviously regurgitating a cultural platitude. “No,” he had answered without hesitation. His son had initially looked shocked, but Jon carefully explained his point. He described how, even if it was his main passion in life, he could never become a professional basketball player at his age – which at the time was 43. There were physical realities that trumped intangible concepts like human drive and ambition. The present situation was different – but not entirely. He wouldn’t and couldn’t suggest that a great job was going to fall into his son’s lap or that such a position would provide him with means and fulfillment for the rest of his days. He couldn’t say that it wouldn’t be, at least at times, a struggle, or that there wouldn’t be periods of life marked by economic anxiety, creative atrophy or professional dysfunction. But he could say that his son would be ok, that he would and could figure it out. This was simply the most likely outcome for a middle-class-originating, college-educated male living in America in the second decade of the 21st century. He was, in fact, set up for this outcome. Jon put on his hat and walked out into the snowbound world, leaving behind a despondent son and two happy-go-lucky dogs. His own work day stretched out before him. And while he was a father first, that wasn’t all he was. There were other roles that constituted the totality of his life. And, like fatherhood, their respective responsibilities refused to quit. The smaller dog’s energy, however, showed no signs of abating. He ran down the carpet-laden hallway that led to his father’s room, before dropping to his knees and turning to face the entrance of the hallway. Minnie charged after him, a tiny yet fiery ball of spirit and vigor. Her black fur stood out strongly against the creamy color of the carpet. He was always amazed at how jet black she truly was, aside from a tuff of white that stood at the center of her chest, reminding him of a penguin. He began to slap the carpet in a fashion that he knew would get Minnie excited. Then he started making barking sounds himself, a move that he knew historically whipped her into a frenzy. The little dog looked at him like he had lost his mind but soon started echoing his barks with her own. After a minute or so, he straightened up, walked over to Minnie and patted her head, prompting her to quickly dance away from him. He still didn’t feel tired enough to go to bed, and he also didn’t want to toss and turn alone with his thoughts. Looking at his two dogs, he decided a walk might be in order, something that would tire them out and maybe help him finally rest. Trudging through the snow outside, he felt an instant sense of relief. What had been ugly and threatening closer to the city now felt light, ethereal and purifying. There were no sounds aside from the soft crunch of his feet and the slight panting of the dogs. It was still cold but not insufferable; and he had no doubt that they could make it to their destination and back before the elements became truly unpleasant. They were heading towards a stream about a half mile from his home, a winding strip of water that twisted and turned through Afton State Park before emptying itself into the the much larger St. Croix River. He had always loved this stream, especially the way it drove through beautiful strands of tress and caressed rocky outcroppings on its way eastward. He had spent many hours walking its length all the way to the river. About halfway through the walk, the road sloped to the left and began to descend, and as they approached, he could hear the low roar of an unseen semi making its way up the hill. Towering pines stood on each side of the road, and he pulled slightly at the dogs leashes, moving them away from the road and closer to the treeline. A few seconds passed and the truck came into view, wheels spinning wildly against the powder. As it passed, he felt Minnie’s leash jerk, which was entirely expected. Minnie had hated trucks ever since she was a puppy, and this animosity manifested itself in a sort of suicidal attitude. Whenever a truck passed them on any of their innumerable walks, Minnie would lunge at it, as if she was going to stop the multi-ton vehicles with her small, 20 pound body. It was a comical quirk, but one that had caused him periodic stress over the years. The truck eventually pushed its way past the trio, and they continued towards the stream, which sat near the bottom of the hill. Minnie bounded slightly ahead, pushing her nose into various snow drifts before plucking it out again with a big snort. Boston, for his part, walked along at slightly lesser pace, his stride slowing occasionally so could look up at the human that walked beside him. At the bottom of the hill, he looked to his right and then to his left. There were no cars. Not wasting a minute, he began running across the road, the two dogs bounding along on each side. The snow was high and dense on the side of the street, and stepping into it, the lower part of his legs immediately disappeared, which slowed him down immensely. Boston had no such trouble. He threw himself through the snow, looking like a big hairy plow. Minnie was much less capable. Due to her small body and negligible weight, she became quickly mired. Looking at her flailing, churning legs, he couldn’t help but chuckle affectionately before bending down and scooped her up with one arm. “Come here you,” he said. They walked into the trees, making their way towards a familiar path, which was actually more of a deer trail whose route had been reinforced by the countless hikers. It was something he could count on, and, per usual, the trail offered a slight reprieve from the snow’s depth. The powder had been padded down by what looked like a mixture of animal and human prints. It was low enough here that Minnie would likely be fine, and considering this, he put her small, wiggling body down. Spitting and snapping she hopped away from him, nose darting into the snow before he could take another step. The forest was silent and tranquil. Following the path, they soon broke through tangled, snow-burdened brush onto one of the state park’s official hiking trails. The slight sound of water trickling through ice and bubbling over stones greeted his ears, a sound that never failed to lift his spirits. They set off in its direction and reached the stream in no time at all. The hiking path crossed over the stream by a small, wooden foot bridge, and walking onto it, they stopped to take in the milieu’s sights and sounds. To the right, the stream wound its way out from under the road they had just left, streaking to the left before cutting to the right. It cascaded under a downed, thin tree, which arched over the water, forming a natural bridge. The stream continued onward from there, scooting underneath the bridge where he now stood and plunging further into the state park, finally disappearing around a bend about 500 feet to his left. Only visible in fragments due to collected ice, the water glistened and sparkled as it shot around snow-flecked stones and jostled merrily around the stream’s many twists and turns. It enlivened and fortified him, carrying him away from the exact geographical location of his body into something grander, a bucolic place where his anxieties, hopes and disappointments were far from the most pressing or salient. At least, this was the feeling that the stream typically provided. But for whatever reason, today was proving itself to be more challenging; moments of clarity and relief were failing to materialize. He felt upset. He attributed this partially to his father; he was perturbed that he had no fixes or solutions. It was entirely irrational to feel this way, as his father had already given him everything. Yet he had never asked to be born, never agreed to participate in a society where nearly everything is commodified. And then there was how much he wanted her, a sensation that was deeply embedded, as if present on a cellular level. But as he had known when driving on the serpentine highway, passing the hotel on the grey hill framed by the grey sky, he knew he couldn’t have her back. And somehow that was going to have to be ok. Nothing lasted; even empirical realities were fleeting. How something looked today, how something felt in this moment, was no guarantee of a future result. If one couldn’t fully count on the world’s empirical realities, however, what was one to make of the storytelling that human beings engage in? The perceptions they continually cultivate? The judgments they level? The expectations placed on every individual? So much of one’s self and one’s place in the world was built on condition. Looking down at his dogs, one big and one small, he couldn’t help but smile, as they had started wagging their tails and grinning like fools as soon as they noticed him watching them. They were his and he was theirs, at least for now. But even something as seemingly unconditional as a dog’s loving perception of its human was fragile, a connection that could be altered depending on what he did or did not do. And if that was true, what did it say about everything else? Was there anything intrinsic to a social role, a familial relationship? Did fatherhood carry an innate meaning? Did one’s LinkedIn page or resume speak to the totality of a human being? His commute hadn’t provide easy answers. He had passed entire Minnesotan towns whose prospects had been made or unmade by elements that predated them and, to some extent, were beyond them. And the perceptions of these locales – although perhaps rooted in some sort of “truth” – hardly spoke to the full value of each place or the denizens that called it home. As for his father, although his dad had been born in modest circumstances in a blue-collar town, his parents had modeled concepts of upwards mobility, of hard work, of education being a catalyst for advancement. These were beyond his control, and he had little to do with them. Yet who his father was, what he was, couldn’t be entirely divorced from the inherent. He had found a way to capitalize on his circumstances, utilizing them to become a better man and a better father than what he himself had known. His father had found a way to, more or less, become aligned socially and economically with the perceptions and expectations the culture held towards his demographics. He was who he was supposed to be, a reflection of 20th and 21st Century achievement, where each subsequent generation was supposed to obtain more than the last. He began walking again, leaving the stream behind, which continued to flow as it had since before he was born and would continue to do so until long after he had died; although, maybe not in the same way. His weariness seemed to have subsided, to have gone somewhere else. The dogs picked up on this and loped gleefully beside him. Maybe for the first time since graduation, he knew who he was, an impression as valid as any. And who he was was a human being, an ever evolving person living in a rapidly changing world. Like the man he came from and the cities he drove by each morning and night, aspects of his path had been written long ago, forming the idea of a person to which the world assigned perceptions and expectations regardless of their overall validity. The pressure of these perceptions and expectations was onerous, and, even though he could now recognize their falsity, probably impossible to ever fully disavow. But he could try. In reality, his self was flux, his persona an amalgam. He would never be finished and it would never be finished with him. Full of facets and angles, inlets and reservoirs, there was a complexity within him that could never be easily distilled. He was the product of his contemporary actions, shaped by the way the world responded to them and especially by the way it didn’t. But he was also a reflection of his familial origin. He wouldn’t go so far as to say that past was prologue, but it would always be a major part of him. And while this could be constricting, fueling the world’s idea of who he should be, it could also be a boon, pushing him towards what he hoped to become. He fished his hand into his pocket and pulled out his phone. Opening up his email, he rifled through different pages until he found the email he was searching for: an email from his dad and had been sent nearly a year ago. I’m so glad you called yesterday. Just want you to know that I will always be there for you no matter what. Call anytime. I love you and am proud of the fine young man you’ve evolved into. The transition to adulthood with all the responsibilities is difficult, and you can be proud of yourself for all your accomplishments. Keep looking forward and know that if you treat yourself and those around you with respect and love good things will come your way. He could remember when he had received that email and could also picture the call to which it referred. He had been in a low place, having recently graduated with no hope of landing a job and ended the relationship that he continued to pine over today. The path wound around a corner, guiding him briskly to the left and up a steep incline further into the state park. He accepted this gladly, walking towards the east, away from the road, away from the complex, traversing the snow-covered lane into what was both startlingly real and too easily forgotten. The world didn’t care about his pain. It was apathetic to his neurosis. It was disinterested in variation, only seeing the main typifying features of his constitution. It couldn’t account for her or what she had meant, which was as much a part of him as anything related to social role or vocation. Then she was in his thoughts again, running through cerebral contours like a electric charge. They were playing late night pool again. Riding bikes on the lakeshore path again. They were on his balcony in Bridgeport again, watching for faint glimmers of stars within Chicago’s hazy nighttime sky. They were singing karaoke again, her transcendent, him oafish, but both enjoying it the whole time. And he knew that if she was here now he would tell her how happy he was that she had been in his life, of how thankful he was that he could now count her as part of him. He reached down and gave Boston’s lower back a playful squeeze, which made him break into an excited run. Minnie took her cue from this and also surged forward, causing him to jog in order to keep pace. The wind whipped across his exposed face, stinging the tip of his nose and causing his eyes to water. Frosty trees and woods passed by on all sides, and the steam created by the trio’s collective breath trailed behind them. The snowpack made it difficult to gain much speed or momentum. Yet mid-stride he realized that he was happy. A fleeting moment surely, but one that at this particular moment felt deep and all-encompassing. There was nothing aside from these woods and these dogs. He was in the present. Career, work, money were nugatory on this hill. The only thing that mattered was arriving at the summit, basking in the morning light and looking appreciatively at the open sky.